The smartwatch, as a concept, has faced several obstacles on the path to mainstream popularity, not the least of which is a limited range of input options. With the iWatch, Apple will need to tackle this issue, among others, but the solution might already be built into iOS. With a small display that makes typing almost impossible and other touch inputs slightly more difficult, voice control could be the answer. Apple already has the groundwork laid out with Siri, but, as a new report states, the voice-controlled virtual assistant will need some expanded capabilities to truly improve smartwatch functionality. This includes opening Siri up to more third-party applications, such as non-Apple messaging apps. Apple is pursuing such a possibility, one that would allow outside developers to build for Siri without requiring specific licensing agreements between the companies. 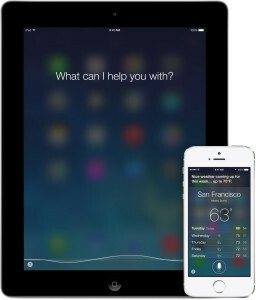 For services like Wolfram Alpha, their inclusion as part of Siri’s current list of functions comes as the result of direct dealings with Apple, a setup that has led to what many perceive as the stunted growth the voice assistant application. The iWatch might also feature contextual display options that would adjust the information presented to the wearer based on data gathered by built-in sensors. For instance, if the iWatch senses its wearer has headed out for a run, a fitness tracking app would automatically be displayed. Such capabilities would go a long way in addressing the drawbacks inherent with smartwatches, which so far have struggled to present information in a way fit for a smaller touchscreen display. In the same way, voice input could lift the iWatch from simple companion device to a functional standalone wearable not limited by its form factor. It’s safe to say Apple hasn’t been stewing on the iWatch this long for no reason. There are very real issues that the company has needed to tackle head on in order to create the sort of product that would have the same type of mainstream impact as the iPhone and iPad. So far, competitors have had little luck stirring up much excitement for their smartwatch offerings. Apple could just be the company to change that.